Stan is running for the Normal Town Council. Meet him tonight! He actually wants to hear from you, unlike the current Council. 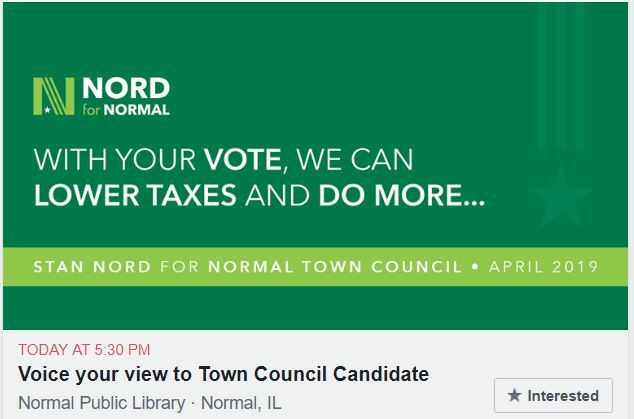 Posted in BloNo, elections, Koos, Local, Normal, Pamela Reece, Taxes.Tagged Normal Town Council, Stan Nord. IF I lived in UPTOWN, I’d surely vote for STAN!! I hope he’s able to “get the ball rolling” in the RIGHT direction when he’s elected! I can’t wait for the Chamber of Commerce to NOT endorse a businessman! Of course fellow socialist don’t have a problem talking to each other! It’s the people paying the bills they don’t want a discussion with. Lorenz and Fritzen are socialists? Riiiight. I’ve never had a problem having a dialogue with Council members either. You’re confusing dialogue with agreement. It doesn’t do any good to talk to a Council member if your opinion doesn’t matter.